Refilling a small tubeless tire can be a challenge. A tubeless tire of any size requires the inside bead to be firmly seated on the wheel hub or rim in order to hold air. So how do you get it to seal up so that it will hold air? Well, you can struggle with trying to squeeze the tread in which usually requires two people, or simply hold it with a strap as described here. If the tire requires a patch or new valve stem, do that repair first, obviously, so that it will hold air. In my case with this tire, it was simply low on air and it was hit from the side which broke the bead, so it just needed to be refilled. Strapping around the outer dimension (tread side) of the tire will push the bead out against the rim and hold it there until you can get the air pressure up. This turns this into a one man operation, that would usually require two. This also makes it possible to pump up with a hand pump if that is all you have. 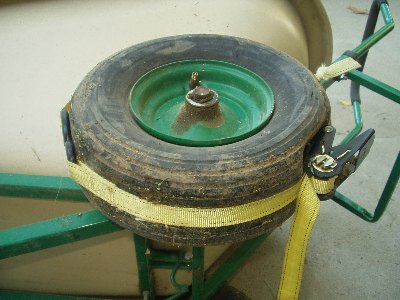 As seen here, I have used a ratchet type of tie down around the diameter of the tire to hold it in place. A ratchet tie down or strap is the easy way to go, but you could also use any type of strap or even rope, it will just take more muscle. These types of tires are used on many garden tools and barn equipment including wheel barrels, dollys, feed buckets, small trailers, carts and wagons.